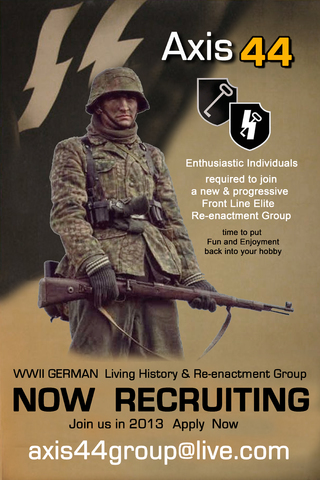 with a modern and fresh approach to re-enacting and living history. Formed recently by experienced re-enactors and military enthusiasts, it's foundations have been built on strong team spirit with a focused core impression. a Zug/s of 25 to 30 with a realistic rank structure to reflect the number of individuals. along with various original and replica vehicles weapons and equipment. A relaxed ethos is paramount , but accurate and quality uniforms and high standards of presentation are equally important. We strive to maintain an enthusiastic environment and ensure each member is given true opportunities to enjoy there hobby. type of events we attend and the creative displays we present for the public. we will happily respond to any enquiry. and will enable you to enjoy your hobby. Thank you for taking time to read our recruitment message. Last edited by Hauser on Mon Dec 17, 2012 5:53 pm, edited 1 time in total. If you guys get tired of walking into battle....please don't hesitate to 'thumb a ride'.....on the back of our stug battalions vehicles! Thank you for your good wishes Harold. 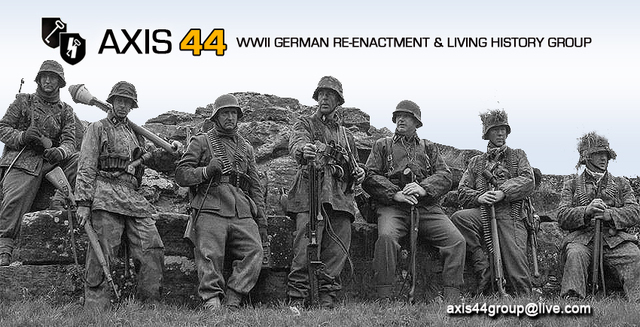 I am sure th Axis44 lads would love the lift into battle upon one of your fine panzer vehicles.